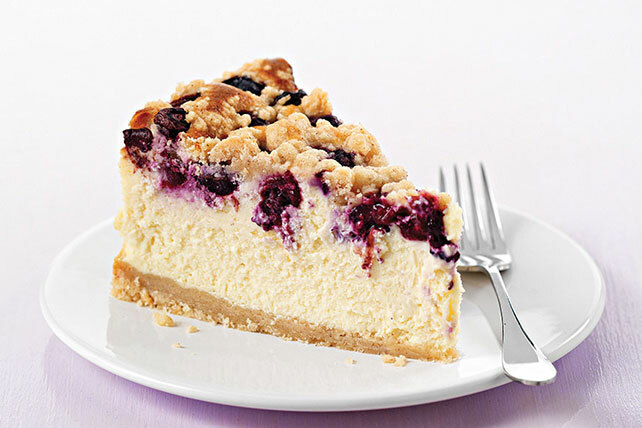 Get the best of both worlds with a PHILADELPHIA Blueberry Streusel Cheesecake! Top this PHILADELPHIA Blueberry Streusel Cheesecake with a fruity crumble. Combine 1-1/2 cups flour, 1/3 cup sugar and cinnamon in medium bowl. Cut in butter with pastry blender or 2 knives until mixture resembles coarse crumbs. Reserve 1/2 cup crumb mixture; press remaining onto bottom of 9-inch springform pan. Bake 25 min. or until lightly browned. Meanwhile, beat cream cheese, remaining flour, remaining sugar and vanilla with mixer until blended. Add sour cream; mix well. Add eggs, 1 at a time, beating on low speed after each just until blended. Prepare using 1 pkg. (16 oz.) thawed and drained frozen blueberries. Garnish with additional berries or cinnamon before serving.